Bengaluru, Oct 29 (IANS) Green energy like solar power would power India as 175 gigawatt (GW) of electricity is expected to be generated from renewable sources, Prime Minister Narendra Modi said here on Sunday. “By 2022, when India will be celebrating 75 years of independence, 175 GW of renewable energy will be generated. 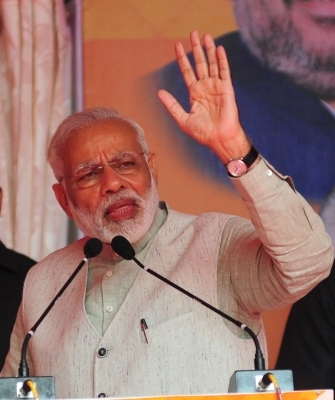 The government is working towards meeting 40 per cent of the country’s energy needs from renewable sources like solar and wind by 2030,” said Modi at a public function in the Palace Grounds here. “LED bulbs earlier cost Rs 350 and through Ujala scheme they cost just Rs 40-45. Around Rs 7,000 crore was saved in the country by this price cut. These bulbs also helped in cutting down the electricity bills for the households. With just a different approach, we could make a huge difference,” he said. Asserting that the future is not of diesel and petrol, Prime Minister said startups should look at innovations that help the country’s population. “Bengaluru is the land of startups. I invite entrepreneurs to join in a movement in creating solar-based stoves that are inexpensive. Innovation should be in that direction that can help Indian population,” Modi said.